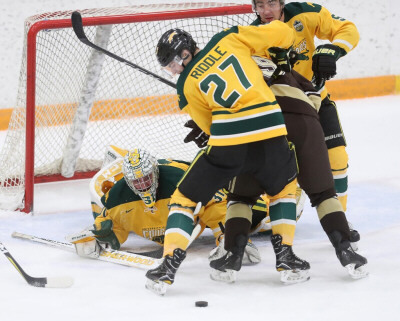 I have two links today, one about MRU's recruiting class and the other with more pre-season games for the BCIHL, plus some Twitter feeds pertaining to the weekend games. Three major junior defencemen in one season is quite a haul. Twitter was about the only source for updates, as is often the case in the pre-season. It sounds like the Evil Monkeys handled the T-irds quite easily. This series is being played in Penticton, as part of the "Young Stars Classic" with Vancouver Canucks and Winnipeg Jets rookies. There are no games scheduled between NHL and CW teams. According to the string of tweets, this was scoreless until late in the 2nd when the Dinos took a 2-1 lead. In the process, they enjoyed a 26-12 edge in shots on goal. Presumably that 3rd period must have been quite dominating as Bedrock U outscored the Griffins 4-1 in the period. This one was held in the Town of Bedrock, and Saturday's rematch will be in Edmontown. The Dinos also have a recruiting announcement, available in the links. They have now confirmed five recruits from the WHL. They have two defencemen coming, and three forwards. Not much can be gathered on this one. Lethbridge has been through some turmoil so any sort of a win must be a great relief. The Horny Ones held period leads of 2-1 and 3-2. The Bison roster page is still in 2017-18. In fact, Calgary and Regina are the only teams in the league with a 2018-19 roster page. That may change by the end of Friday. No teams have posted a weekend preview as I post. There is no news from the Bisons, except a tweet from Victor Findlay stating that leading scorer Michael St. Croix will not be returning. This is a traditional Friday-Saturday double-header to be played in British California. NAIT joined up with MacEwan to lose 9-1 to the Edmonton Oilers. (That same melange defeated the Greasers a year ago.) The T-irds are coming off a split against the Monkeys, which included a game two shoot-out win. Sep 15 Western Ontario at U.O.I.T. Last edited by Hollywood; 15-09-2018 at 10:35. This was the opening night of the Regina Tournament. There isn't much news about these game out there. The SAIT Twitter had a blurb and all teams' S&R pages have a score without a link, at least as I post. So both Bison wins so far have been 2-1 games, and they are now 2-3-0 in the pre-season. It would be nice if someone in Regina tweeted out a picture of the lineup cards. On Saturday, it will be S.A.I.T. v Regina at 1:00 CDT and Manitoba v Saskatchewan at 4:30 CDT. The first game was played Thursday in Cowtown and the second was Friday in Edmontown. The two wins give Bedrock U the tournament title, and a 4-0-0 record in pre-season. It's Yabba Dabba Doo time. The Evil Monkeys are now on a two game losing streak! MRU and Alberta will fight it out for second place on Saturday. Regan Nagy with the lone goal at 15:00 of the 3rd, Papirny with the 38-save shutout tonight at the Brick tournament in Edmonton! The T-irds are now 2-1-0, with both victories coming in extra time. It could be that kind of year for them. Nice of them to post a boxscore. Other CW teams should take note. Sep 15 N.A.I.T. (ACAC) at U.B.C. Last edited by Hollywood; 15-09-2018 at 10:36. Time to bring back the asterisk for links that are missing as I post but may show up later when you read. There were no game stories nor boxscores/summaries posted for either game. Only the Manitoba Twitter had a tweet. In any event, I guess if medals were being awarded, the Mutts claimed gold, the Bisons settled for silver, and the Kittens got a bronze. The Condoms got nothing but experience. 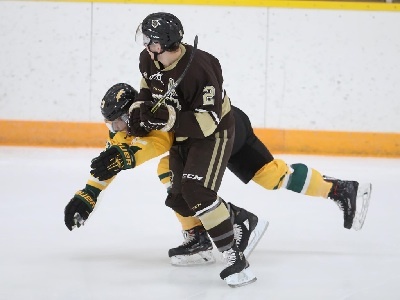 So returning Zach Franko and rookie Devon Skoleski paced the scoring for the Bisons this weekend. Rookies also did very well on the scoring in the UK tour as well. 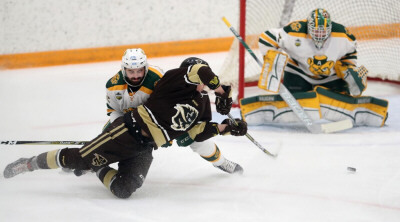 Next weekend, the Bisons have just the one game, that being a Saturday matinee against Regina. The week will start with York's sad commemorative tour of Saskatchewan. Oddly, the above-linked story from the Ottawa Citizen is their story on Sask's recruiting. I have no idea why such a story would be printed there. Alberta's site has yet to add their Athabasca exhibition games to their posted schedule. MRU acknowledges that they face the Dinos, and not Minnesota State, on Wednesday. However, their official schedule has yet to make the correction. 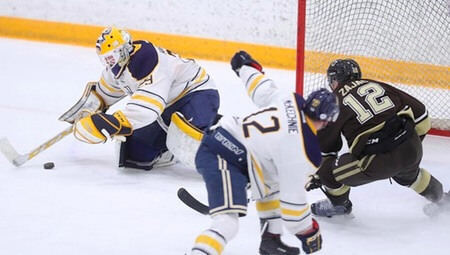 This win gave UBC a sweep of the weekend series, and gave the CW a record of 8-0-0 against ACAC teams this pre-season. UBC out-shot MRU 36-23. Patrick Dea got the win, and four different Birds scored goals. Sep 18 Moncton at St. F.X. Sep 21 Laurier at U.O.I.T. Sep 21 St. F.X. at U.Q.T.R. Sep 21 Simon Fraser (BCIHL) at U.B.C. Sep 21 Toronto at R.M.C. This was cut back from two games to one in order to allow the Banjo Cats to play York on their tour in memory of Mark Cross, their former player who went in to coaching only to perish in the Humboldt tragedy. The Bison roster page has been updated. Several new rookies are listed, who were not included in the recruiting announcements. I'll need to do some profiles on them. In all, there are 12 new recruits. The odd thing is that the team is low on numbers. Although bursting with four goaltenders, they have just 21 skaters. Though most of those were frequent scratches, St. Croix was the leading scorer and Laurencelle was oft-injured but was the CW rookie-of-the-year two years ago. My guess is that there are a couple of bodies yet to be added. There were two mid-week games for CW teams this week, followed by a pretty full slate of games to come on the weekend. The Bluegars hit the win column to go 1-2-0 in their final pre-season game. The Dinos move on to face York and Sask on the weekend. They are now 4-0-1 in the pre-season. This was the opener of York's memorial tour in honour of alumnus Mark Cross, one of the Humboldt victims. This game was played in his hometown, Lumsden, Sask. Regina is now 2-1-0 in pre-season. This was York's first game. Sep 22 Trinity Western (BCIHL) at U.B.C. The U-Cup hosts will enter the regular season with no games against a CW opponent. They started with a sweep of Red Deer College and now it's off to Thunder Bay for a traditional weekend series. Sep 23 Alberta v N.A.I.T. Sep 22 Concordia at U.Q.T.R. It was nice to see my first live hockey of the season. Unfortunately, I never noticed the game time change from 3:00 to 2:00. So I missed two 1st period Bison goals. 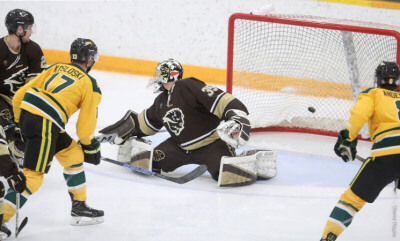 Since the Bisons wore jerseys with a black number on a brown background (the CW has a rule whereby the home team wears light/dark in alternating seasons now), and Regina had yellow numbers on a white background, it was hard to tell who was out there. Also, my pen ran out right away, forcing me to use my cell phone to make notes. This is the best I could figure. 3-0 Garrett Armour - Top shelf over the glove on a one timer from Thomas Freeman. 4-0 Carter Doerksen - A tip-in on a cross-the-slot passing play. 5-0 Zach Franko - A replica of the 4-0 goal which went in as the prior goal was being announced. 5-1 Connor Odelin - A power-play goal broke the shut-out. Penalty shot - Adam Henry was being used as a forward in this game and was hauled down on a break-away. Dawso9n MacAuley made the stop. 5-2 Tristan Frei - Another power-play goal when time was almost up. 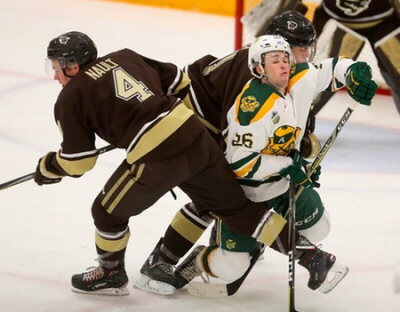 The overall impression is that the Bisons have added a lot of quick, smaller forwards who made Regina run around. Let's see how they do as the competition will get better very quickly. The defence was under almost no pressure. Spriggs had no more than two tough saves to make. Were they good, or does Regina lack offensive punch? The Bisons are off to the Town of Bedrock next weekend, the to the Excited States after that. The next home action is October 12th and 13th against the Evil Monkeys. 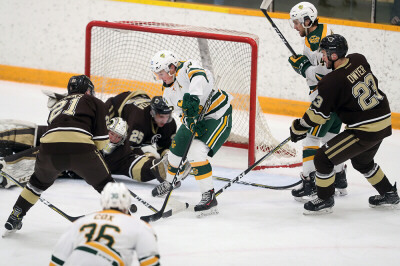 On Friday night, there were just four CW teams in action, one against the ACAC, one against the BCIHL, and two against OUA teams. The Saturday night games will be updated later. This was part of the Athabasca Tournament, which also includes NAIT and MacEwan from the ACAC. Maybe one day Athabasca will have a team of their own. Not much is posted on this game, and that makes sense. The Monkeys aren't bragging, and their side-campus doesn't need to be shamed. The linked story is about their new WHL recruits. They only have two this year. That's all they need, due to a bumper crop of returnees. This one is part of the "Captains' Cup" series. SFU beat Holy Trinity in the opener of the 3-team round-robin. UBC does a good job on media postings for pre-season games, treating it just like a regular season game. Good for them! York was crushed in this one, to go 0-2 on their romp through Banjoland. They have one game left to avoid a whitewash, against Sask. 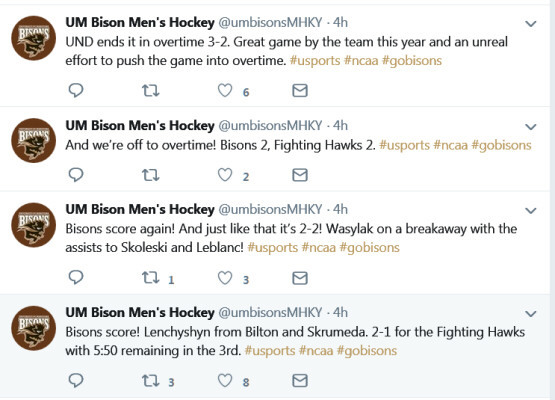 The Bisons haven't been to T-Bay in a while. At one time, it was a really tough road trip and the Wolves looked like they would be a powerhouse. Hasn't turned out that way, though. The Hǿrny Ǿnes rallied from down 5-2 to make it close. This was the OUA's first interlocking win of the season! With the Bisons playing a matinee, I did not have to wait for the other games to finish before posting. So here's what happened Saturday night. This concluded the "Captains' Cup" series, in which UBC went 2-0, the SFU Clown went 1-1, and Holy Trinity pulled up the rear at 0-2. The Spartans were off to a 2-0 lead 2:20 into the 2nd period, but the T-irds stormed back to tie the game before the 2nd period ended then won going away. Shots were 30-20 on the night. 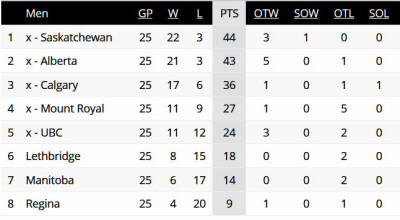 I guess one could say of this series that the results were respectable for the BCIHL but their teams are still a ways away from being CW calibre. In all, UBC went 5-1-0 in pre-season after starting with a loss. All I know comes from the Dinos' Twitter. Sask scored two powerplay goals to tie and then win the game. Sask is now 3-0 in the pre-season, and finishes with what should be the final game at The Rutherdump on Sunday against York. Meanwhile, the Dinos return to the Town of Bedrock where they open the season next weekend against the Bisons. Lethbridge held a 5-3 lead in the 3rd period before blowing the lead and ultimately losing in overtime. The linked story from LU says this is their first pre-season sweep since 2010. Jeesh. In any event, two tight losses for the 'Horns leave them at 2-1-1 for the pre-season, albeit without having played a team from the CW. Last edited by Hollywood; 30-09-2018 at 20:23. Last edited by Hollywood; 12-10-2018 at 21:12. Last edited by Hollywood; 24-01-2019 at 07:31. Last edited by Hollywood; 26-01-2019 at 20:16.